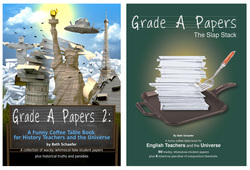 What is Grade A Papers? My father, Ted, was an English teacher for 37 years at a community college. Ted stirred his students with his compassion, humility…and brilliance with words. I see him now: grading papers on the porch, at the picnic table, and most often, at our dining room table. I used to write fake student papers and insert them into his piles as a practical joke. I did this sporadically for nearly 15 years. I never pretended to be a real life student. All the characters and their voices have always been imaginary. My papers are about celebrating students—their unique ideas, personalities and writing. Above all, of course, the purpose: to make my dad laugh. In May 2013—almost six months after our loss—I heard my dad’s voice at my door. I awoke and opened my eyes to a new life. He told me to keep writing fake student papers.